Spinach is a annual that grows to maturity in about 40-50 days in the Pacific Northwest. It is a hardy cool-season crop that does best at temperatures of 60 to 65ºF, but can withstand temperatures as low as 20ºF. Spinach is intolerant of temperatures above 77ºF, these warm temperatures combined with long days initiate the plants reproductive stage, causing it to bolt or flower prematurely. That means right now is a good time to seed spinach for a late spring harvest. To do this, simply direct seed into your garden bed. Once the seeds have germinated and are an inch or two high, thin to 3-12 inches apart to prevent plants from crowding and becoming leggy (when most of the growth is in the stem). The amount of thinning depends on the variety and when you want to harvest your spinach. If you want to harvest the spinach while the leaves are still small (like the baby spinach you buy in a bag at the store), thin less. If you want larger plants, thin more. In a few months you may have to pull out your spring spinach crop as the temperatures begin to rise and the plants stop producing but you can direct seed them back into your garden again in late summer. To supply the Bastille Restaurant's rooftop garden with Fall, Winter, and early Spring spinach we started sowing seed as early as August 24, and continued seeding until late September. I was up there the other day and some of the beds of spinach that were seeded in August are still producing and look great! Part of that success may be due to the greenhouse covers we put on the garden beds there in late September. If you are overwintering your spinach you may want to consider some sort of row cover to protect them from the frost. Clearing your spinach beds will create space for spring and summer lettuce. Lettuce also thrives in cooler temperatures, but its optimum growing temperatures are higher than spinach at about 65-75ºF. Generally temperatures around 85ºF will cause lettuce to bolt. Be careful when you are choosing which lettuce varieties to plant because some are more tolerant of the heat than others. 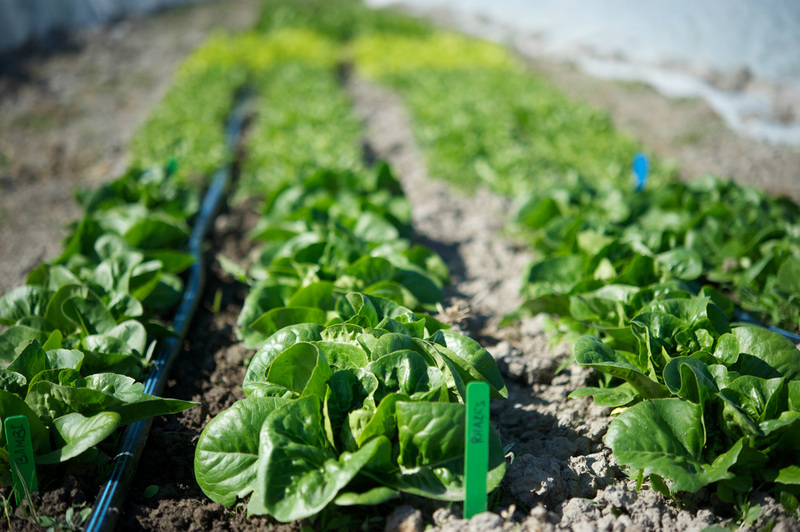 When starting lettuce this time of year, we use different varieties than we do when starting lettuce in May or June. There are four distinct types of lettuce: looseleaf (or bunching lettuce), and three heading types-crisphead, butterhead, and romaine (or cos). Chrisphead, also known as "Iceburg"- Many of us remember this crispy, tasteless lettuce from our childhood but it has fallen out of vogue on the culinary scene in recent years. I'll be honest, from time to time I still crave a wedge of it drizzled in blue cheese dressing and bacon bits. I wouldn't be a bit surprised if we see locally grown iceberg lettuce with artisan blue cheese and organic bacon reemerge on the culinary scene on summertime menu's next to the truffle butter popcorn. Butterhead- This is a semi-heading lettuce, characterized by smooth soft leaves that form a loose head. In the last few weeks we have started Deer Tongue Oakleaf and Dancine for our spring crop. Nancy and Buttercrunch are varieties that we have found do well here as a summer crop. Romaine(or cos)- Distinctive by it long narrow leaves and upright growth habit romaine lettuce is a must for Cesar salad lovers. I also think it has great flavor for juicing. Winter Density and Paris Island Cos are varieties we use for spring. Jericho is a good summer variety. Looseleaf- Looseleaf lettuce does not form heads and has the most variation in leaf color, texture, and shape than any other lettuce type. Looseleaf are generally more tolerant of various environmental conditions than head types and are slower to go to seed. Within these lettuce categories there are so many different varieties. I have named just a few that grow well in the Pacific Northwest. Lettuce is a great crop to experiment because of its relatively short life cycle so try some different varieties and let us know how it goes!